City of Prineville leaders opened the Crooked River Wetlands Complex last Earth Day with high hopes for the new wastewater treatment facility. Not only did the plan increase wastewater capacity for 50 years of future growth and save millions over constructing a mechanical treatment plant, they hoped to provide a new educational and recreational park for residents to enjoy. Nearly one year has passed, and it seems those hopes have come to fruition, and in some ways, have exceeded expectations. Regarding wastewater treatment, the effectiveness of the new system has been scrutinized this year by the Department of Environmental Quality, and the results have been encouraging. 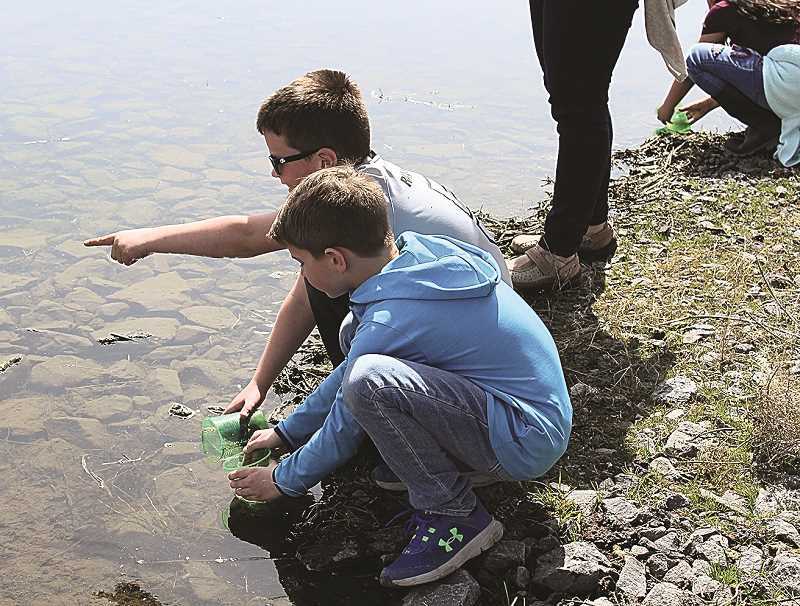 "For the first year, DEQ had us do a lot of testing," said City Engineer Eric Klann, who played a prominent role and making the wetland a reality. "Everything worked as we expected it to." He explained that with the new wetland system, city wastewater first goes to the treatment lagoons that the city has relied on for years. After bacteria cleanse that water, it is piped to another storage pond where it used to be used to irrigate a city-owned pasture. Now that water is piped into the 13 cells that comprise the wetland and from there it seeps into the ground before returning to the floor of the Crooked River. "We have these groundwater monitoring wells where we sample the water before it pops up in the bottom of the river, and we are hitting drinking water standards there," Klann said. He went on to note that the DEQ limit on biological oxygen demand (BOD) for the groundwater is 10 milligrams per liter during the summer and 30 milligrams per liter during the winter. "We are getting down to 1 milligram per liter," Klann proudly states. The city engineer acknowledges that the success has come with some learning curves and challenges, particularly when it comes to insect control. He notes that they focused heavily on mosquito control and managed to avoid an increase, however they have seen a huge increase in gnats and midges. "Those midges came out of nowhere," Klann said. "We will work through that." Part of that effort will include the work of local youth who have sought out the facility for various projects. Klann noted that a Boy Scout is completing a bat box on the wetland for his Eagle Scout project in the near future, which is expected to help with the insect problem. 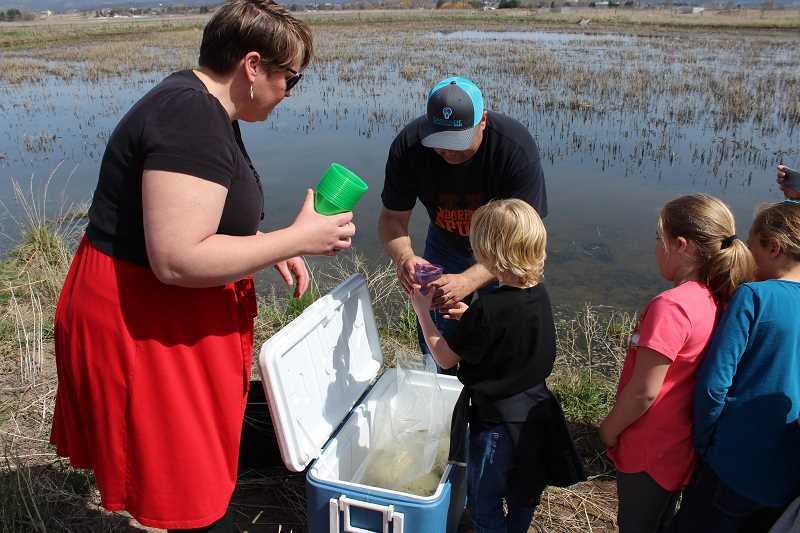 Also, just this week, Barnes Butte Elementary School first-graders helped Klann plant 500 blue gill fish in the wetland. "We are using those to help with the gnat issue," he said. The first-grader efforts are part of a storyline curriculum that will take place during the next couple of months for the young students. "All of the first-graders are going to become experts on the wetland," Klann explained, adding that they will visit the wetland several times. The storyline is just the latest in what has been a steady string of students using the wetland for educational purposes, a goal Klann had publicly shared on many occasions during development of the facility. Mixed with the educational uses are people who spend time on the wetland to go for a walk or a jog or check out the birds that show up to roost. "The birders all over Central Oregon love the site. People are out there every single day – rain, sleet or snow – exercising," Klann gushed. "I am really amazed at how well it is being used. I figured you would see a few cars out there a day (in the parking lot), but on a sunny spring day, you see as many as 15." And sweeting the success of the wetland, it didn't take long for the city to start reeling in accolades for the wastewater treatment facility. The wetland was named the 2016 Project of the Year by Eastern Oregon American Water Works Association. Oregon Association of Clean Water Agencies gave the city its 2017 Outstanding Membership Agency award, and the American Council of Engineering Companies of Oregon named the wetland its 2017 Project of the Year. Both organizations will consider the local facility for national recognition later this year. In addition, Klann was named Conservationist of the Year for his work on the wetland by the East Cascades Audubon Society, and the League of Oregon Cities gave the city its Award for Excellence. As year two approaches, city leaders look forward to further enhancing what the wetland offers. Klann expects more birds to come to the facility this year now that the vegetation has matured, and a footrace will take place on its trails later this spring. "We are going to have our first 5K/10K race," he said. "It is going to be a fundraiser for the high school and middle school cross country teams." And of course, the wetland looks poised to serve its primary purpose not only in the coming year, but long into the future. "It will take care of our wastewater for years to come," Klann concluded.